You are currently browsing the category archive for the ‘Cabin Fever’ category. On Thursday, March 15, at the Ilsley Public Library in Middlebury, Otter Creek Audubon held our third Cabin Fever Lecture series presentation of the winter on Pine Martens, presented by Vermont Fish & Wildlife biologist, Chris Bernier. This talk centered on reintroduction efforts for this weasel family species, explained their current status in Vermont and their difficult relationship with Fishers. If you missed this presentation it can viewed online here thanks to the production facilities of Middlebury Community Television. Normally we only hold three presentations over the winter, but next moth we will be hosting a special presentation by Mark LaBarr and Margaret Fowle giving us the results of their Golden-winged Warbler migration tracking project. That will take place April 12, 7pm at the Ilsley Library in Middlebury. In the meantime, if you would like to see more, many of our past presentations can be viewed at this link. On Thursday, January 11, at the Ilsley Public Library in Middlebury, Otter Creek Audubon held our first of three Cabin Fever Lecture series presentation of the winter with the Bird Diva, Bridget Butler speaking about Crows & Ravens. Considered harbingers of evil by some, and for others an endless curiosity. Bridget explained how intelligent crows really are, the difference between crows and ravens, and their complex social structure. If you missed this presentation it can viewed online here thanks to the production facilities of Middlebury Community Television. Our next Lecture, The Jewels of Ecuador, presented by Hank Kaestner, will take place on February 15, 7pm at the Ilsley Library in Middlebury. In the meantime, if you would like to see more, many of our past presentations can be viewed at this link. On Thursday, February 9, at the Ilsley Public Library in Middlebury, Otter Creek Audubon held our second of three Cabin Fever Lecture series presentation of the winter. 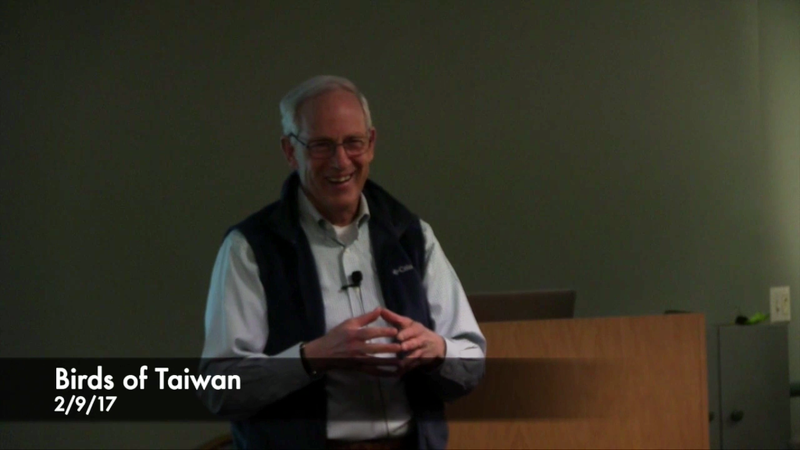 World-traveling birder, Hank Kaestner, gave a very entertaining presentation on the Birds of Taiwan. If you missed, and we know many did due to the weather, this presentation can viewed it online here thanks to the production facilities of Middlebury Community Television. Our next Lecture, Wild Utah: America’s Red Rock Wilderness presented by Travis Hammill, the Eastern Grassroots Organizer with the Southern Utah Wilderness Alliance, will take place on March 9, 7pm at the Ilsley Library in Middlebury. In the meantime, if you would like to see more, many of our past presentations can be viewed at this link. Cabin Fever Lecture Series – Canada Lynx: A Vermont Resident? On Thursday, January 12, at the Ilsley Public Library in Middlebury, Otter Creek Audubon held our first of three Cabin Fever Lecture series presentation of the winter. Vermont Fish & Wildlife biologist and Furbearer Project Leader, Chris Bernier, gave a presentation about the lives and status of the Canada Lynx in Vermont, a listed state endangered species. If you missed this presentation you can view it online here thanks to the production facilities of Middlebury Community Television. Our next Lecture, The Birds of Taiwan presented by Hank Kaestner, will take place on February 9, 7pm at the Ilsley Library in Middlebury. In the meantime, if you would like to see more, many of our past presentations can be viewed at this link.